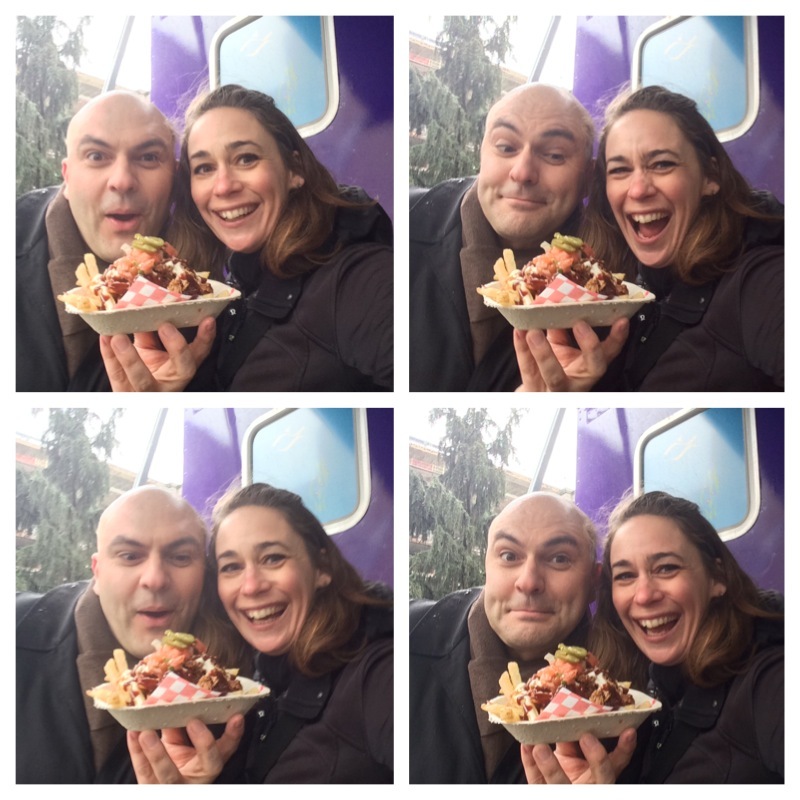 Archive for Food Truck Adventure! Last week was a really tough, slog-through-the-work kinda week. By the time I got to Friday, I was pooped, and I felt like I’d earned a treat. So got dressed up and headed out to meet my friend Raj for lunch. Now, Raj is turning 35 this year, and she has a list of things she wants to get done before she does. One of them is “have lunch in Paris.” Now, we didn’t actually go to Paris, but we dressed up in our best French outfits and ate crepes, so it was pretty darn close. Raj and I make funny faces and eat crepes. It’s Friday. Ze Bite is a food truck that has been operating on the streets of Vancouver for about two years. The owner, Mathieu Gicquel, also had a “before a I turn a milestone birthday” to-do list, and it included living abroad, owning a business, and learning to speak English. He knocked off all three with Ze Bite (although his English has a charming Parisian accent that influences the names of the dishes he makes, and if you want to practice your French, he’d be happy speak en francais with you). Gicquel grew up in kitchens, namely his grandmother’s kitchen in France. Restaurants are in his family, both his sister and his uncle have them. Gicquel, however, became an engineer. But after moving to Canada at the age of 31, he decided he wanted to own his own business, and food seemed like a natural fit. Ze Bite, which promises to be “a taste of France in one bite,” offers crepes and baguette sandwiches. There is also a soup (Mediterranean tomato) and a salad available. You’ll mostly find them in the 800-block of West Cordova. Gicquel’s menu is heavily influenced by Morrocan spices, especially on Ze Moroccan. It’s chicken marinated with cumin and other moroccan spices, and served with mint, hummus, greens and grainy dijon. You can have it on your choice of a baguette (Gicquel sources his baguettes from Baguette and Co) or a gluten-free buckwheat crepe, which he makes right in front of you. Click here for a Gluten-free, Vegan Buckwheat Crepe recipe. Other menu options include Ze Pig, a citrus and spice braised pork with crispy apples and spicy jalapeños, or Ze Francais, which rosemary ham, tomato sauce, dijon, and greens. I had the vegetarian option, Ze Provencal, with tender roasted eggplant, zucchini, and peppers, finished with greens, tomato sauce, dijon, and herbs du provence. For dessert, there are many sweet crepe options, like Nutella, salted butter caramel, Raspberry Jam, or the classic sugar/butter combination. Gicquel is also incredibly passionate about spreading his love for French food to the younger generation. He has a program where he brings the truck to high schools and teaches the kids how to make crepes. 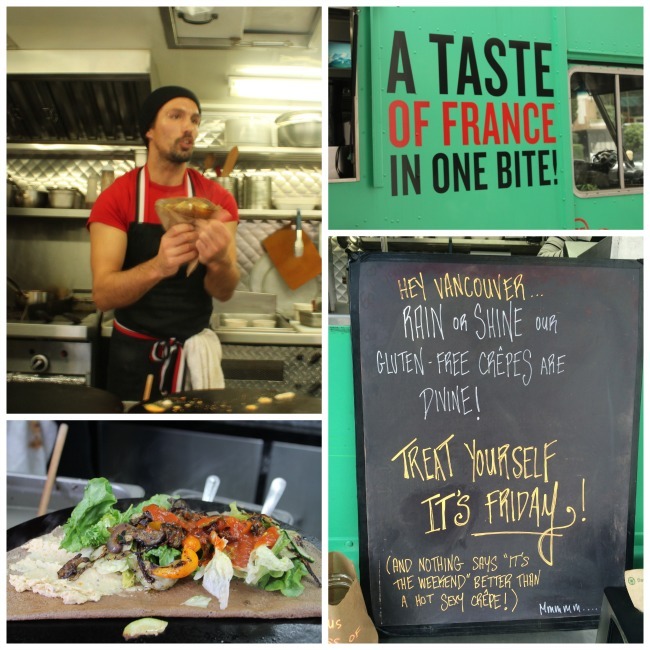 Ze Bite is worth tracking down–it’s the taste of France, right here in downtown Vancouver. Find them onine at ZeBite.ca. 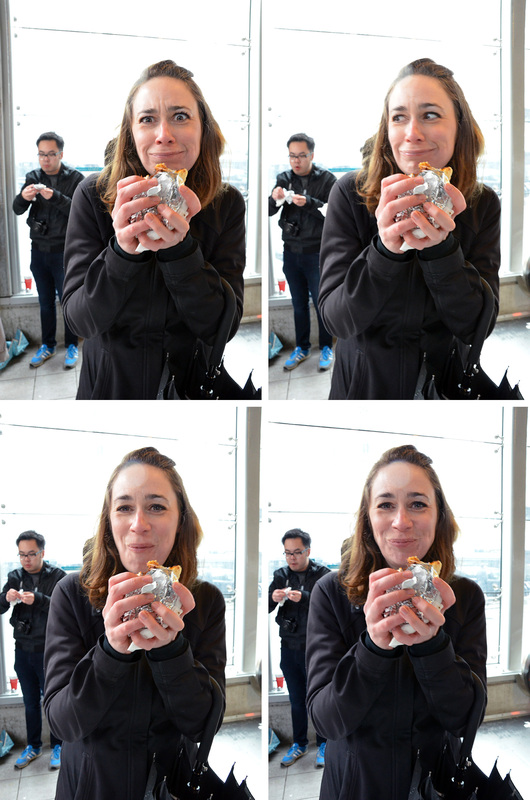 The life of a food blogger is varied, but never boring. There are some days I’ll be struggling with recipes that just don’t work out in the kitchen, and then there are other days I hit it out of the park on the first try. Sometimes you eat at restaurants that are, shall we say, less than amazing, and then there are other days when you find hidden gems. Yesterday was a very good day for being a food blogger. I got invited to go out for lunch with a bunch of other food bloggers, and our intrepid guide was the host of Eat St on the Food Network: James Cunningham. Cunnigham was in town to promote a new contest that’s being sponsored by Lay’s Canada. #DoUsAFlavourCanada is a contest that allows you to create your own potato chip flavour, and the winner gets fame and fortune! Given that James’ “thing” is Food Trucks, he took us to three of his favourites: Soho Road Naan Kebab, Feastro, and Roaming Dragon. Our first stop was outside the Georgia and Granville Skytrain Station, where my old pal Sarb had parked his tandoori oven on wheels. 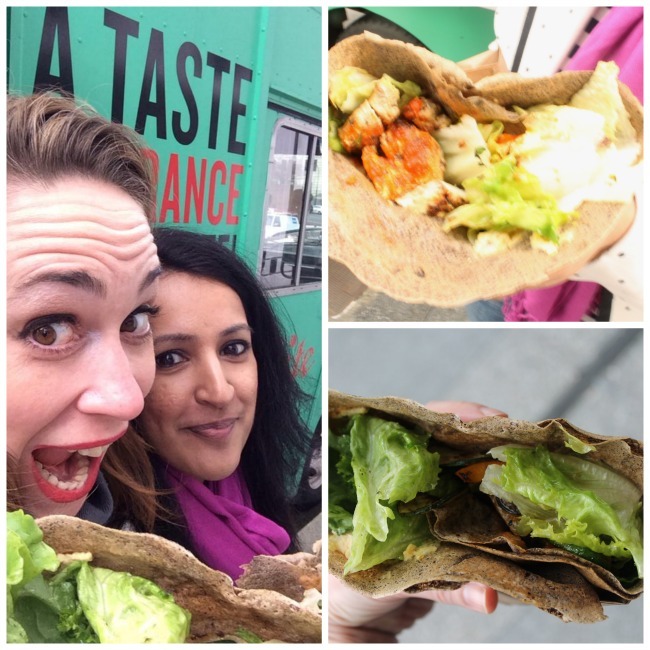 I’ve long loved Soho Road (see my interview with Sarb here), but he made something special just for us: a Lamb Tikka Masala wrap. The lamb was grilled with a mixture of middle eastern spices, like cumin, cinnamon, and coriander, then served with pickled red onions and a minty sauce inside a warm, freshly-baked naan bread. I particularly love the play of textures in this wrap: the crusty bits of the warm naan bread, against the tenderness of the lamb. Stop number two was a block down, just outside the Vancouver Art Gallery, where the Feastro truck was parked. Their offering was a new menu item they have just added: Dirty Fries. 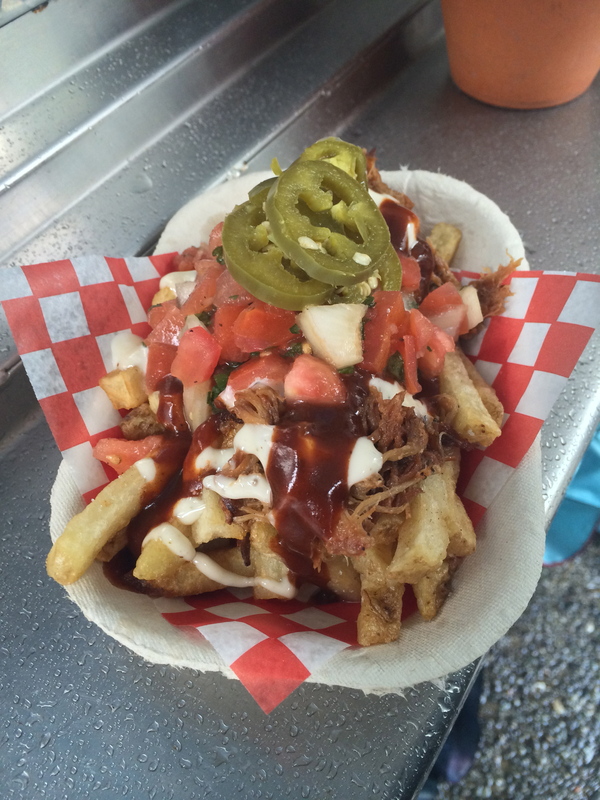 Double-fried, then topped with barbecue sauce, aioli, pulled pork, salsa and jalapeños, these fries were indeed dirty–they are not something you can eat without getting messy–and delicious. Our final stop was at Roaming Dragon. 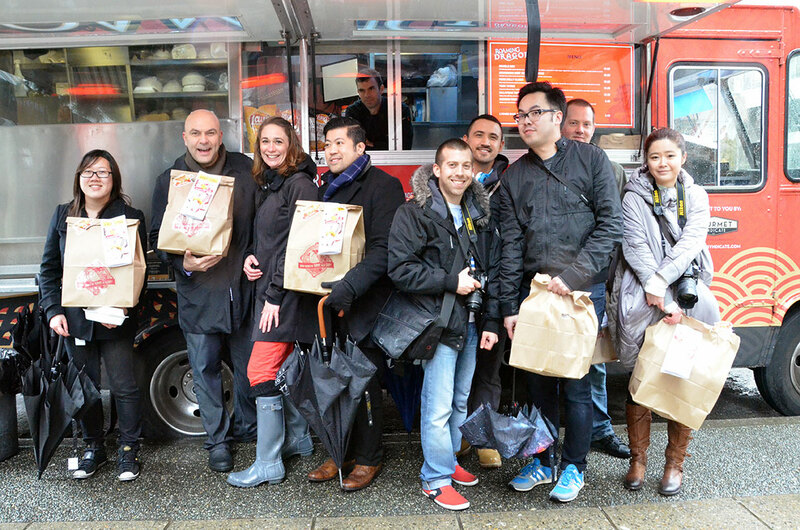 Roaming Dragon was Vancouver’s first food truck, opening in June of 2010, and they remain one of Vancouver’s top trucks. Their rice balls and pork belly sliders are legendary! 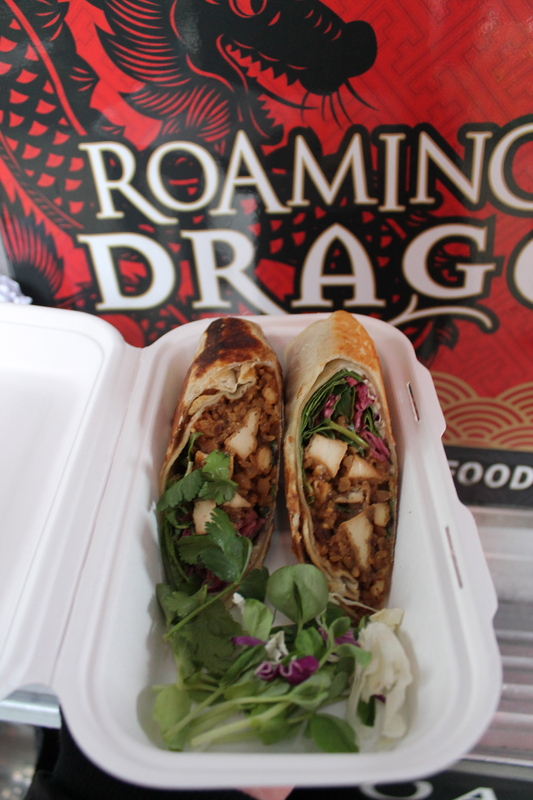 The Roaming Dragon truck served up their Malaysian Chili-Lime Tofu Burrito. It’s not a staple menu item of their food truck, but it is on their catering menu. I eat a lot of vegetarian food, and I just need to say, it’s difficult to make tofu taste good, but these guys did it. This was my favourite bite of the day. It was freezing cold and rainy, but the food was awesome and warming, and we bloggers had a great time chatting with James Cunningham (who spent a lot of time hamming it up for our cameras) and hearing his stories. 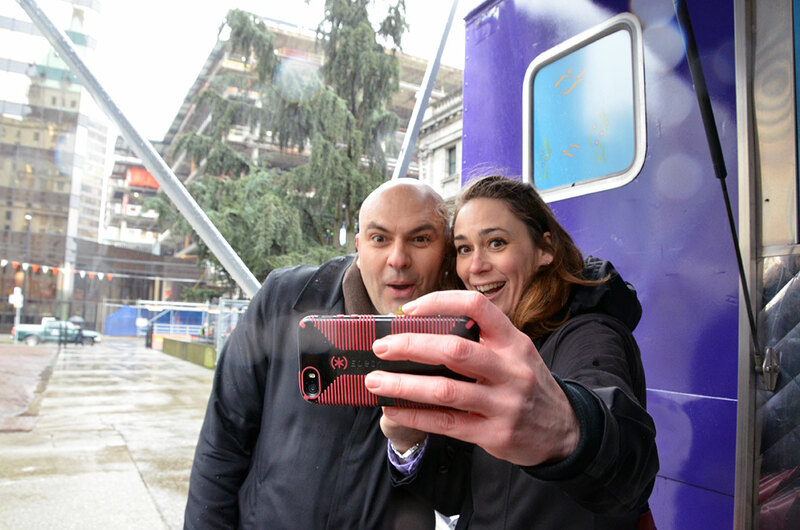 He maintains that Vancouver’s Food Truck scene is the finest in the country, and this guy has eaten at a lot of Food Trucks! Big thanks to Lay’s Canada, Soho Road Naan Kebab, Feastro, and Roaming Dragon.